Lattice Quantum Chromodynamics (LQCD) is currently the only known model independent, non perturbative computational method for calculations in the theory of the strong interactions, and is of importance in studies of nuclear and high energy physics. 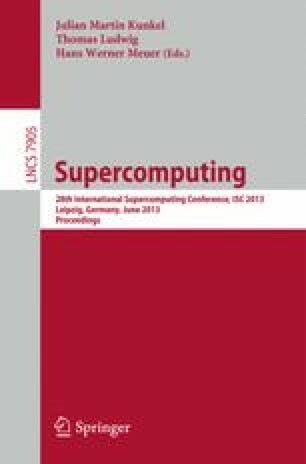 LQCD codes use large fractions of supercomputing cycles worldwide and are often amongst the first to be ported to new high performance computing architectures. The recently released Intel Xeon Phi architecture from Intel Corporation features parallelism at the level of many x86-based cores, multiple threads per core, and vector processing units. In this contribution, we describe our experiences with optimizing a key LQCD kernel for the Xeon Phi architecture. On a single node, using single precision, our Dslash kernel sustains a performance of up to 320 GFLOPS, while our Conjugate Gradients solver sustains up to 237 GFLOPS. Furthermore we demonstrate a fully ’native’ multi-node LQCD implementation running entirely on KNC nodes with minimum involvement of the host CPU. Our multi-node implementation of the solver has been strong scaled to 3.9 TFLOPS on 32 KNCs. 1.Thomas Jefferson National Accelerator FacilityNewport NewsU.S.A. 3.Parallel Computing Lab.Intel CorporationSanta ClaraU.S.A.